Additionally you deal less damage when you are fighting with the same element. Elements really affects the outcome of any battle. When doing quest and vortex gate, you are going to fight an amount of battles and deal with single element enemies (You may encounter different element but with a small chance). 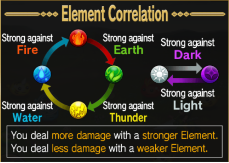 So by creating a good squad that has stronger element than enemies element is recommended. If you do not have a squad that has stronger element than the enemy , you can also choose any element that deals regular damage to each other or you can also have the same element of your enemy but the battle will be longer. Your squad consist of maximum of 5 units, in battles you can add 1 random unit or 1 friend unit. When doing quest or vortex (except for arena because of element randomness) you should counter their element. However creating a 5 units with the same element is hard when you always fuse units or evolve units. A perfect squad contains 5 powerful rare units with same elements. When you only have 1 or 2 or none rare units with same elements, it is advisable to avoid fusing of units especially the Max LVL ones. A squad of Max LVL units are good enough to battle with average enemies. You can also equip your squad with spheres. Spheres can be re-equip to any units any time. Fuse units gives experience for your base unit while sacrificing other units. 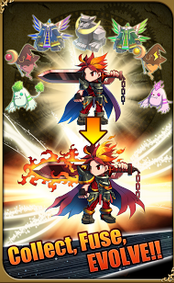 When you fuse with the same element, it will give more experience to the base units. Also success rate of fusing will increase the multiplier of giving experience to the base unit. Success = 1.0 Exp, Great Success = 1.5 Exp, Super Success = 2.0 Exp. Max LVL units cant be a base unit but you can sacrifice them. However you should avoid that because it is your recipe to evolve for some units. The best use of fuse for starting players is to have a base unit that are humans or any units that are not weak with good abilities. The purpose of fusing is to boost the stats of your unit by leveling them and to be qualify for evolution. High level leader units through fusing can attract more friend request. When your units evolve, it will increase its stats and the level will go back to level 1 but increasing it's new maximum level. It will increase its star by one, a three star and above are rare units similar with you can get in "Rare Summon". You need MAX LVL UNITS to evolve. The chosen leader will use its LEADER SKILL in battles. For example a three star Burning Vargas has a leader skill of 25% boost to atk power of fire types. This is very effective when your squad are consist of fire elements.